A 62-year-old man has been charged with the murder of nine-year-old schoolgirl Jennifer Cardy who was abducted and killed near Lisburn 28 years ago. The child disappeared from Ballinderry village in August 1981 while cycling to a friend's house. Robert Black was born in Scotland but is resident in England. He has been served with a summons charging him with the murder. It is understood he was working in NI at time of the murder. After the schoolgirl went missing, her red bike was discovered in a field beside a hedge, close to her Ballinderry home. Fishermen later found her body at McKee's Dam near Hillsborough in County Down. The file on her murder has never been closed. 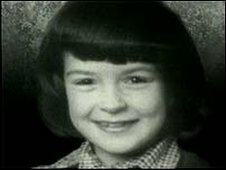 It is understood that a police review of the case some years ago may have produced new leads.